It’s not Easter for me unless I have my mom’s Sicilian Easter Cuddura cu l’Ova. 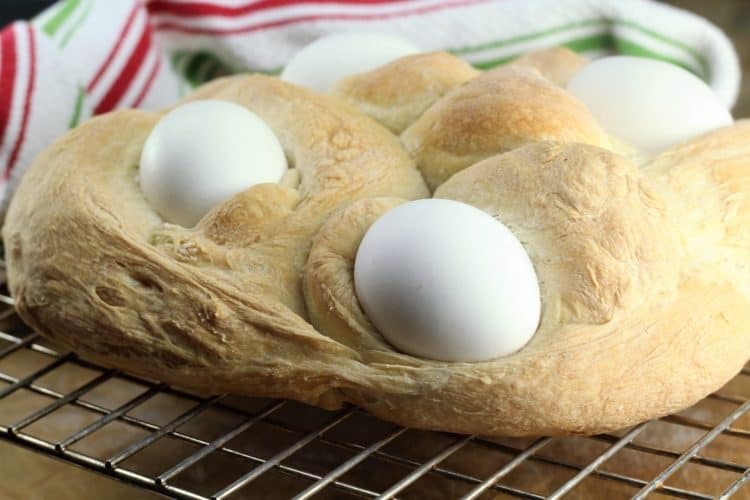 This traditional Easter bread with eggs nestled in it is the gift that my mom prepares for her children and grandchildren each year. This post was initially published in March 2016 and updated April 10, 2019. At this time of year most people have chocolate eggs, chicks or rabbits on their minds. Except for me! 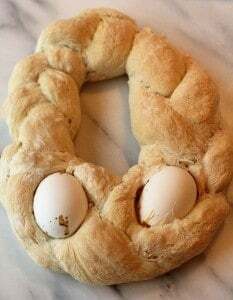 I look forward to my Sicilian Easter Cuddura cu l’Ova, a traditional braided bread baked with eggs nestled in the dough. This is the gift that children in Sicily receive each Easter (at least they did back in my mother’s day) and this is what I look forward to each year. There’s no doubt that I love my Sicilian ricotta pie or my Pastiera at Easter time. But it would not be complete with cuddura. So what exactly does cuddura mean? This word, in Sicilian dialect, has its origins in the Greek word “kollura” which means crown thus referring to the circular shape of the bread. Begin by making a basic bread dough. Combine the yeast and sugar in a small bowl and cover with warm water. Let sit for 10 minutes. In a large bowl, combine flour and salt. Make a well in the center and pour in the prepared yeast. 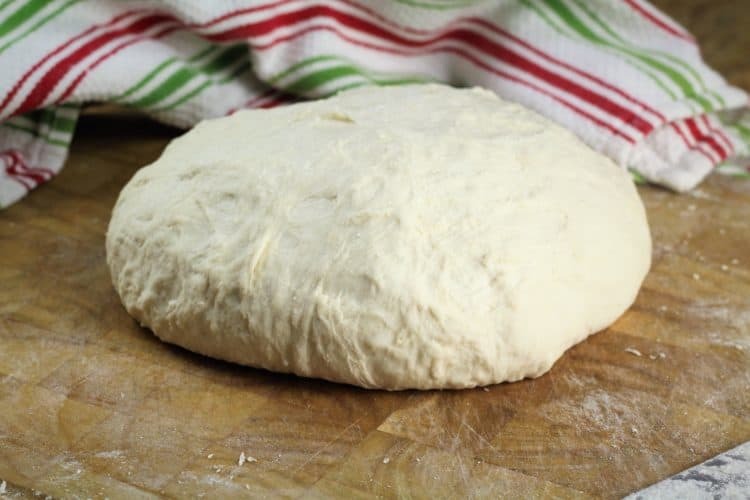 Stir together with a wooden spoon to make a soft dough. Pour the dough on to a well floured surface. It will be quite sticky at this point. 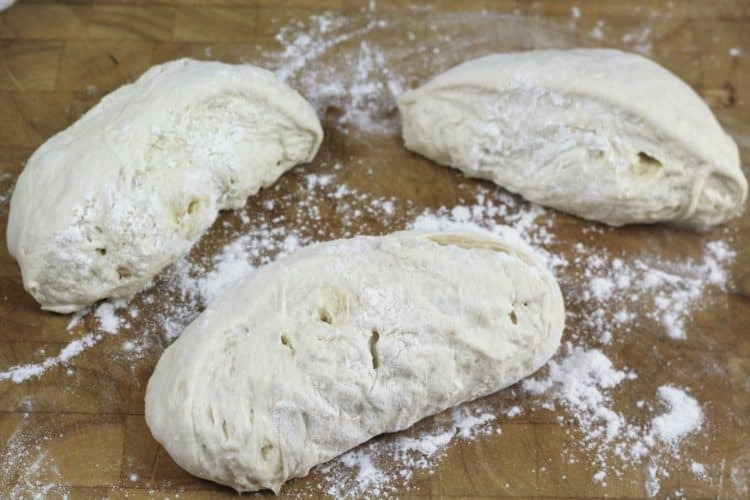 Gradually add the remaining flour, kneading it into the dough. Knead for about 10 minutes until smooth, but still soft. Transfer to an oiled bowl, cover and let rise for 2 hours. 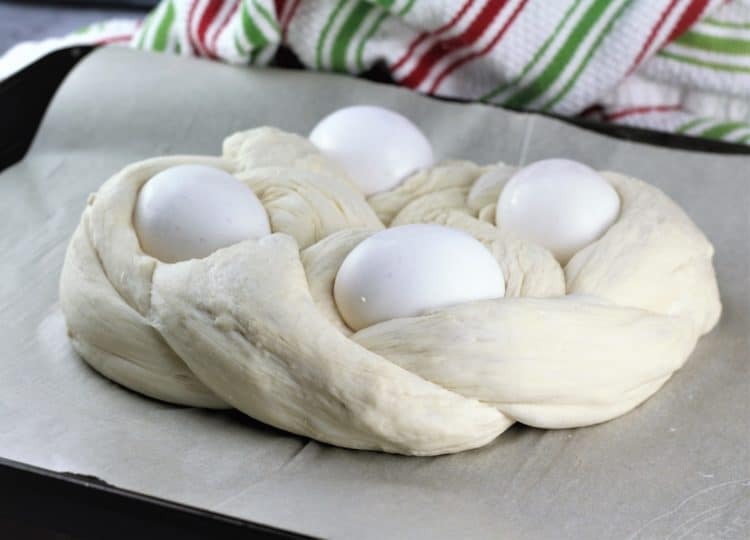 Place the eggs in a bowl and cover with warm water while you shape the dough. When the dough has risen, cut in two. 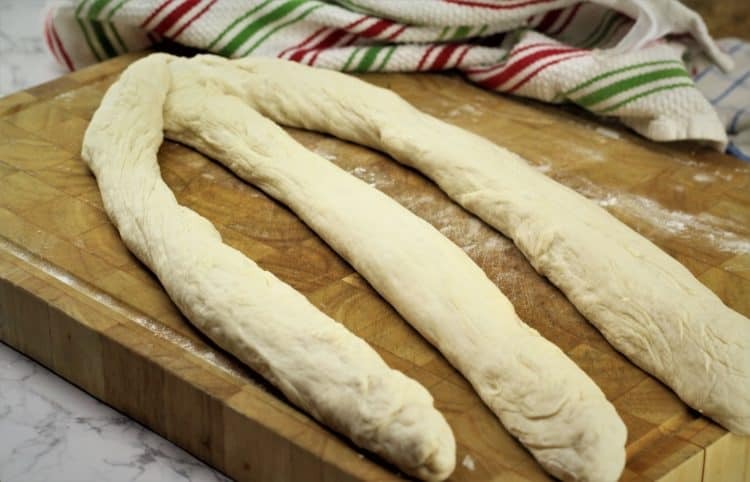 Working with one piece at a time, divide the dough in 3 and roll out each piece to about 20 inches. 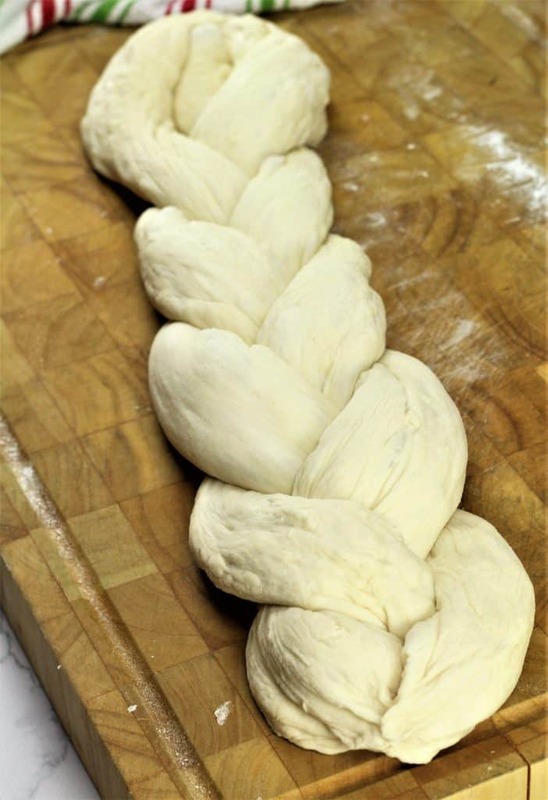 Pinch the ends together and begin braiding the dough. Pinch the ends together. Bring both ends together to form a circle. Nestle the eggs in the crooks of the braid. Preheat oven to 350F and let the cuddura rest while the oven preheats. Bake for about 45-60 minutes, until the bread is golden both on top and underneath. Let cool before serving. The eggs do not require boiling prior to baking. Place in a bowl covered with warm water while you are shaping the dough. They will bake in the oven. Store the bread at room temperature for up to 3 days. Remove the eggs from the bread and store separately in the refrigerator. The bread can also be frozen (without the eggs) for up to 3 months. For children, the bread may be shaped as a basket as shown. This one was prepared by my mother for my daughter a few years ago. 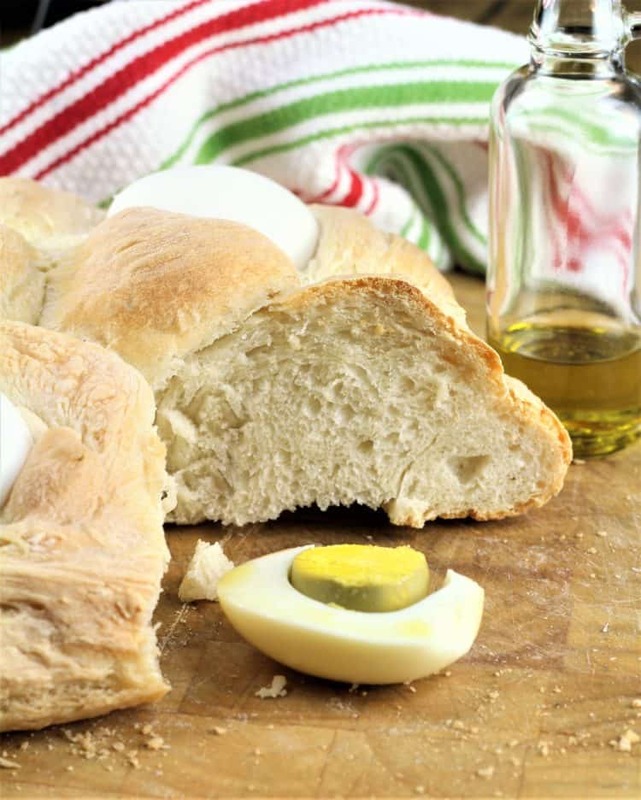 While I’ve seen countless versions of this traditional Easter bread made with a sweet dough, I’m partial to my mom’s basic bread dough version. That’s because it’s perfect to eat with the baked eggs! Let me share with you our typical way of eating the eggs. Peel the eggs and mash in a bowl. Add olive oil, salt and a bit of lemon juice. Yes, lemon juice! Trust me, it’s delicious with the eggs and then the bread, of course, is a must to mop up all the bits of egg! You know that your children, grandchildren, nephews and nieces will receive tons of chocolate this Easter, so why not start a new tradition and offer them homemade cuddura? Let me know if you give this recipe a try. Don’t forget to tag me with your photos with @mangiabedda or #mangiabedda on Facebook or Instagram. Happy Easter! 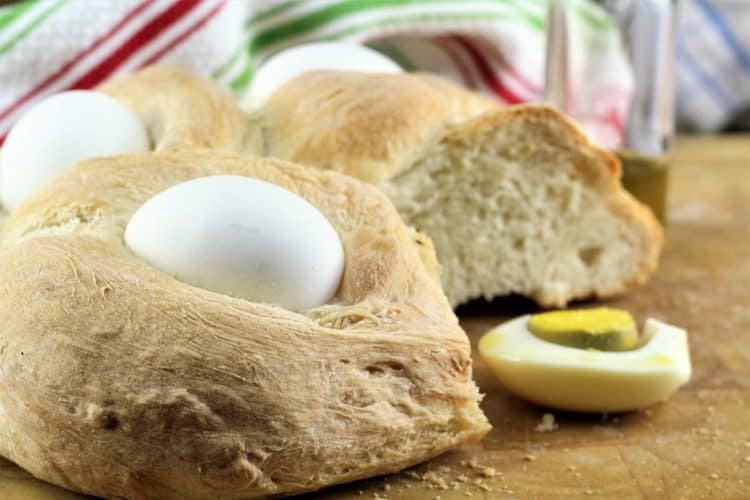 Sicilian Easter Cuddura cu l'Ova is a traditional Sicilian bread nestled with eggs and presented to family and friends each Easter. Place yeast and sugar in a small bowl and add ½ cup of the warmed water. Let sit for 10 minutes. In a large bowl combine 3 1/2 cups flour and salt. Make a well in the centre and pour in the yeast mixture. Add the remaining 3 cups of warm water and stir with a wooden spoon to form a dough. Place the dough on a lightly floured surface, it will be very sticky. Gradually add the remaining flour, kneading it into the dough. Knead about 10 minutes, until smooth and elastic. Place the dough in a lightly oiled bowl, cover with a cloth and let rise for 2 hours until doubled in bulk. Cover 2 baking sheets with parchment paper. Place eggs in a bowl, cover with hot tap water and let sit for 10 minutes while you shape the dough. Punch down the dough and divide in 2. Divide each half into 3 equal pieces. Roll each piece into a -20 inch long rope. Braid the 3 ropes and form a circle by pinching the ends together. Transfer to the prepared baking sheet. Nestle 4 eggs at equal intervals into the dough. 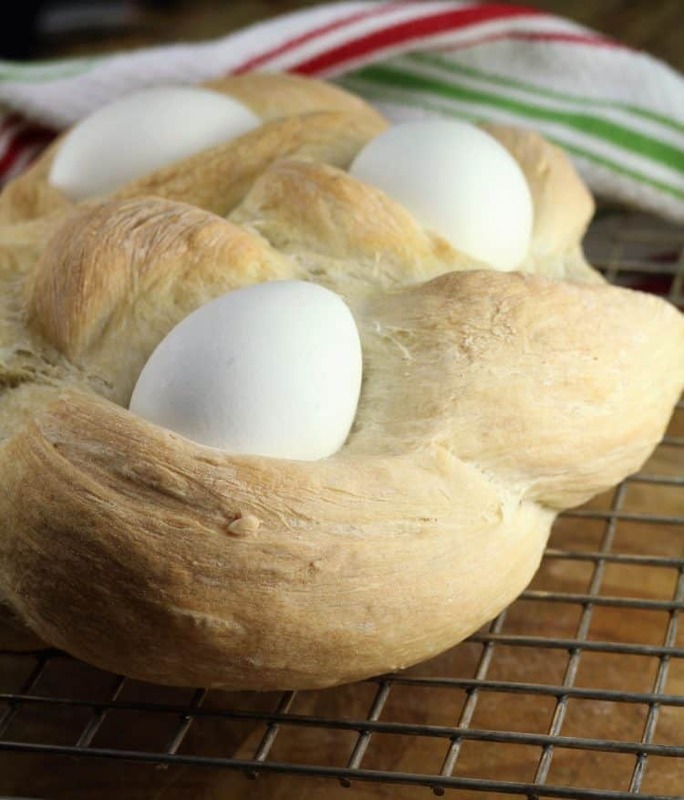 To form a basket, nestle 2 eggs on the bottom of the braid and slightly lengthen the top part of the braid to shape the basket’s handle. Repeat with the remaining dough. Preheat oven to 350F. Let the cuddure rest while the oven preheats. Bake for approximately 45-60 minutes until the bread is golden on top and underneath. Let cool before slicing. Please note that baking time may vary according to each oven. The bread is ready when golden in color both on top and underneath. It will have a hollow sound when you tap it. 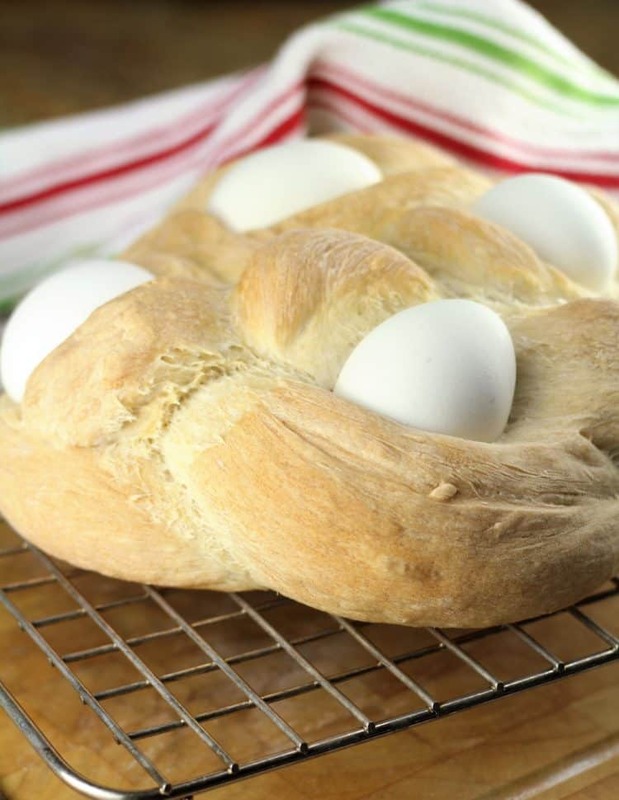 My mother-in-law used to make this bread for us at Easter and for our children. She was from Campagnia. You've inspired me to make them for my children this year. Unfortunately, I did not write down her recipe. Thanks for sharing yours. It's always been our family tradition! Thanks Liliana! My mother in law made these.. Thanks for the recipe ( in english).. Thank you for sharing this recipe! 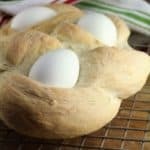 I have a question - does placing the eggs in hot water prior to baking the bread help to cook the eggs more thoroughly? Or do the eggs come out more like soft-boiled eggs? Thanks! Hi Anne, it's actually more for tempering the eggs before adding to the hot oven for baking. You don't want them to crack as they bake. The eggs do turn out hard inside. Thanks for stopping by! 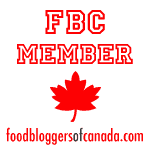 Hi Sara, that’s exactly why I started this blog, in order to preserve these recipes so they are not forgotten! Of course the name cuddura may have varied from one region of Sicily to another. My mother’s cuddura is savoury but many make a sweeter version with the coloured sprinkles as your nonna did. I appreciate your comment and thanks for stopping by my website! I am excited to try this recipe. Mama always made one big one and several smaller ones for each of us 6 kids with one egg. What joy! Often too, she would surprise us with a sweet dough rather than bread dough as you show. Any chance you could provide us with a recipe in the future for the sweet dough? It was not cloyingly sweet, just seemed to me as I remember like the cookie dough she used at Christmas which she called Taralle, but not the kind used for drinking wine, just in different shapes. I am sure you are familiar with the cookie I am trying to describe. It was like pulling hair to get an accurate recipe from mama and most of what I do is more from memory than accuracy. You have provided me with some really terrific recipes, close to what I remember, and am so grateful to you. That's exactly what my mom does as well! She makes the little ones in the form of a basket and puts one egg on it. She's never made it with the sweet dough. But you're right, I should try it that way. My husband's nonna used to make it with a cookie dough but unfortunately I can't ask her for the recipe any more! I'll ask my mom if she has a sweet dough recipe for cuddura so I can try it. Thanks for your lovely comments Anna, they are appreciated! Hi Karen, I know exactly what you're talking about. It's called "pupa cu l'ovu" which means doll with an egg in it. These can be shaped in different ways such as baskets, bunnies, dolls and so on. We call them cuddura as you saw on my blog and my mother prepares them for each of her children and grandkids each Easter. This recipe uses a basic bread dough but there is a sweet version as well. I checked with my cousin in Sicily who told me that she uses a typical breakfast cookie dough to make these. You can find that recipe on my blog as well under "Italian Breakfast Cookies". Hope this helps and have a Happy Easter! Hello Karen, you are very welcome! I totally understand your need to keep here memory alive through her recipes. Happy Easter to you and yours as well! Copyright © 2019 · Mangia Bedda! Receive all the latest recipes directly in your inbox. Simply enter your email address and name below.